in terms of people, growth and business operations. “We are forecasting low growth ahead so the time has come for the industry to do things differently. Embedding diversity in talent, geography and business models should be considered strategic imperative in the search for growth,” Megan Brownlow, PwC's executive director says. For the first time PwC conducted “geospatial economic modelling” to get a picture of who works in the media and entertainment industry to profile this against the broader population. The report also looked at on-air and TV talent and whether these reflect Australia’s diverse population. In radio, for example, 70% of on-air talent is white, male and over 40 years old. The report found that 82.7% of people who work in media and entertainment are monolingual and speak only English at home. Most live in Sydney and are clustered round the Inner West and Eastern Suburbs. (See below for a list of the top 10 Sydney and Melbourne suburbs with the highest density of media people). “Similar to the world we see depicted by media, entertainment and media businesses do not reflect an Australia that’s becoming more diverse by the day,” Brownlow says. of that, 24% live in the Eastern Suburbs or Inner West. Read more about the media and entertainment outlook and adspend forecasts here. You can also get more exclusive in-depth data from the report in the print edition of AdNews, out Friday 10 June. You can subscribe here or get it digitally on Zinio on Android and Apple devices as well as desktop. 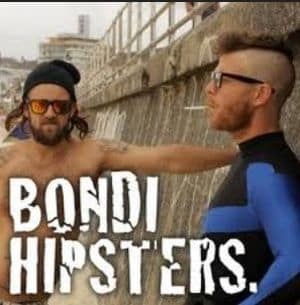 The Bondi Hipster stereotype is alive and well in media and entertainment. The workforce doesn’t reflect the breadth of Australia’s population and the lack of diversity is holding back the industry, according to the latest PwC Outlook report published today (6 June). While the ad market is set to grow to $18.7 billion by 2020 and the total media and entertainment market is expected to grow to $47.4 billion, the lack of diversity in terms of ethnicity, age, gender and thinking is “dragging on the industry’s growth”. The annual report takes a look at the coming five years and outlines adspend, consumer spend on media and the total outlook for various media segments – and the forecast is low growth. Each year PwC tackles a theme and this year it has used a diversity lens to the report to see how it impacts the media industry in terms of people, growth and business operations. Uber for diversity: are you f*cking kidding?